The original art app lives to see another day. 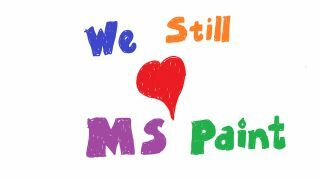 It was big news yesterday: Microsoft Paint looked as though it was to be killed off, when an upcoming Windows 10 update showed that the basic graphics editing program was set to be either removed or no longer developed. First released back in 1985 – with the very first version of Windows 1.0 – Paint is a familiar app to anyone who grew up in the 80s and 90s. It's provided generations of would-be designers, illustrators and artists with their first taste of digital creativity. So it isn’t surprising that the quiet suggestion of its demise was enough to kick up a huge fuss among creatives – both professional and hobbyist – worldwide. Now, Microsoft has announced that the original art app isn’t going anywhere. It won’t remain on Windows 10 by default – but it will soon be available for free on the Windows Store. “Today, we’ve seen an incredible outpouring of support and nostalgia around MS Paint. If there’s anything we learned, it’s that after 32 years, MS Paint has a lot of fans,” said Megan Saunders, general manager, 3D for Everyone Initiative, Windows Experiences. MS Paint’s successor is Paint 3D, which will be available for free with the Windows 10 Creators Update.